Fiveforthree (Ruby Walsh centre) takes the last hurdle in the Ballymore Properties Novices` Hurdle and stays on well to hold off Venalmar (Paddy Flood farside) with Trafford Lad (Tom Doyle blue cap) in third. The red and white scarves were out in force to cheer home Forpadydeplasterer in the Ballymore Properties Novices’ Hurdle but it was his compatriot Fiveforthree, also sporting red and white, who came home best of a clutch of strongly-fancied Irish raiders. Outbattling Grade Two winner Venalmar up the hill, Fiveforthree, who was making his second Cheltenham Festival appearance after finishing fifth in the Weatherbys Champion Bumper last year, won by a neck at odds of 7/1. Ruby Walsh, the winning rider, said: “He was a bit novicey. He missed the second last and I had to use a bit to get into the race but by god he battled back from the last. “It is in his pedigree that he stays, he’s a half brother to Celestial Gold and Escargot is in the pedigree and by god he did stay! The jockey of the second, Paddy Flood, was given a six-day ban for his use of the whip by the stewards. Trainer Mouse Morris was disappointed that Venalmar failed by a neck to match Fiveforthree in the Ballymore Properties Novices’ Hurdle. Trafford Lad could never quite get to grips with the two leaders up the hill and trainer Eamonn Sheedy was particularly disappointed that his horse could not beat Venalmar. “We were a head behind at Naas and the weights favoured us so I would have hoped we could beat him. The ground may not have favoured us,” said Sheehy. The Ballymore Properties Novices’ Hurdle, known for producing future champions such as Istabraq and Hardy Eustace, has attracted a huge entry of 156, including 57 from Ireland. Nicky Henderson’s nine-strong entry is headed by the J P McManus-owned Aigle D’Or. The five-year-old was an impressive winner over Hold Em in the same sponsor’s trial race at Cheltenham on January 26, in which last year’s Ballymore Properties Novices’ Hurdle winner Massini’s Maguire was third 12 months ago. This year’s fourth, fifth and sixth from that race, Razor Royal, Gauvain and Flower Haven, are also among the entries. Champion trainer Paul Nicholls is also well-represented at this stage with seven possibles, headed by this month’s Grade One Tolworth Hurdle winner Breedsbreeze, who carries the famous Best Mate colours of Jim Lewis. The Dicheat trainer’s team also includes I’msingingtheblues, a winner of the Grade Two Anglo Irish Bank Private Banking Novices’ Hurdle at Cheltenham on November 13 and Grade One Ballymore Properties Challow Novices' Hurdle runner-up Elusive Dream. Seeking a 14th win in the race, the raiding party from across the Irish Sea looks to have a particularly strong hand in the two mile, five furlong Grade One contest. Among the Irish entries are Oliver McKiernan’s Whatuthink and Tom Cooper’s Forpadydeplasterer, who filled the first two places in the Grade Two Future Champions Novice Hurdle at Leopardstown in December ahead of Majestic Concorde, Aranleigh and Antipode, are among the entries, along with Eamonn Sheehy’s Grade One scorer Trafford Lad. The last-named narrowly failed to defy a penalty when finishing second to Mouse Morris’ smart hurdle Venalmar in the Grade Two Slaney Novice Hurdle at Navan earlier this month. Race sponsor Sean Mulryan may bid to get a portion of the £120,000 prize fund back with Brodimix, who has joined Martin Brassil after winning three hurdles and a Flat race in France. Connections of Smurfit Kappa Champion Hurdle favourite Sizing Europe are represented by stablemate Sizing Africa in the entries. Last year’s winning trainer Philip Hobbs has entered three, including smart Flat recruit Cutting Crew, who has yet to make his hurdling debut, and I Hear A Symphony, a bumper winner in Ireland for Mag Mullins who could carry the colours of last year’s winner for owner Alan Peterson. Hobbs is also represented by County Zen, who followed up a second to I’msingingtheblues at Wincanton with two successes at the end of last year. With the most entries, Alan King’s 10 are topped by dual Cheltenham Grade Two scorer Franchoek, Group Captain, a smart Flat performer who has won both of his start over hurdles, and last year’s Fred Winter Juvenile Novices’ Handicap Hurdle fourth Zilcash. 1. The Ballymore Properties Novices’ Hurdle was introduced to The Festival in 1971 as the Aldsworth Hurdle. Sun Alliance, who merged with Royal Insurance in 1996, took it on in 1974, together with the Sun Alliance Chase, having previously sponsored the Foxhunter Chase. Ballymore Properties sponsored the contest for the first time in 2007. 2. The Ballymore Properties Novices’ Hurdle, along with the Albert Bartlett Novices’ Hurdle and the Royal & SunAlliance Chase, are acknowledged as championship races for the staying novice hurdler and chaser. 3. Only one horse has won both the Ballymore Properties Novices’ Hurdle and the Royal & SunAlliance Chase. The West Awake took the hurdle race in 1987 and the chase event a year later. 4. The smallest field for the Ballymore Properties Novices' Hurdle was 14 in 2000, when there were three non-runners. Previously the lowest number of runners was 15 in 1973, the year of Willie Wumpkins, who later dominated the Coral Golden Hurdle Final at The Festival with three straight wins from 1979-81. There were also 15 runners in 2004 and 2007. The largest field was 29, achieved in 1979, 1984 and 1991. The current safety limit is 24. 5. The Irish-trained 1994 winner, Danoli, was the subject of a massive gamble and was sent off the 7/4 favourite. The shortest-priced winner was another Irish victor, Mr Kildare, at 8/11 in 1978. Favourites have been successful in 12 of the 36 runnings. The longest-priced winner was 40/1 chance Even Dawn in the second running in 1972. 6. The Irish have an excellent record in the Ballymore Properties Novices’ Hurdle with 13 wins, including six consecutive victories from 1973-78. 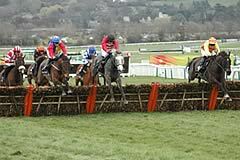 Nicanor, trained by Noel Meade, scored for the Irish in 2006 when upsetting hot favourite Denman. 7. Aidan O’Brien, Martin Pipe, Oliver Sherwood, Mick O'Toole, Edward O'Grady and Nigel Twiston-Davies have each won two Ballymore Properties Novices’ Hurdles. Oliver Sherwood and Dessie Hughes are the two trainers to have also won the race as jockeys. Sherwood was in the saddle on Venture To Cognac in 1979, while his training wins were with The West Awake (1987) and Rebel Song (1988). Dessie Hughes was twice successful as a jockey with Davy Lad (1975) and Parkhill (1976) and sent out Hardy Eustace (2003) to victory as a trainer. 8. The fastest time for the winning horse was 4m 52.0s set by Monsignor in 2000, beating the 4m 56.2s of Regal Ambition in 1990. 9. Istabraq (1997) and Hardy Eustace (2003) both won this race en route to victory in the Smurfit Kappa Champion Hurdle while Davy Lad (1975) went on to take the totesport Cheltenham Gold Cup.